When the wedding day comes, every girl want to feel like a real princess, and to look awesome for her handsome groom. Our girl found her true love, but she needs your help. She is nervous, but also very excited. 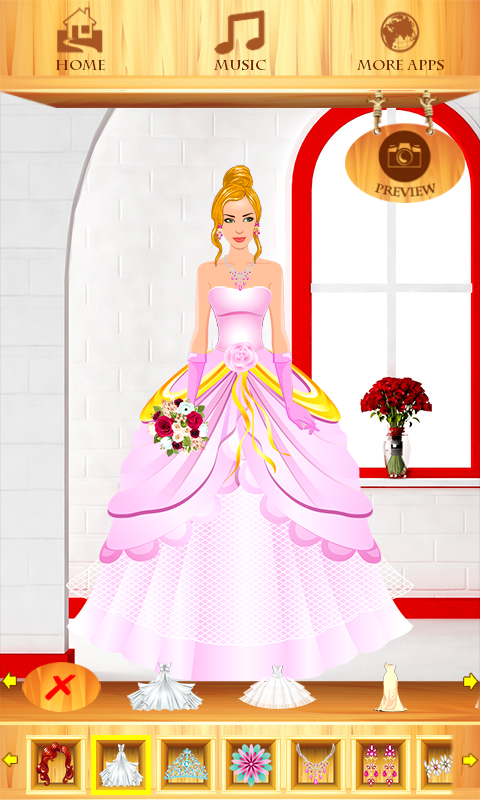 In this latest fashion designer story you have opportunity to create gorgeous wedding dresses. Use your imagination and become the most popular wedding fashion designer. In this cool beauty makeover you can be the owner of the best fashion boutiques and choose awesome and trendy wedding dresses. 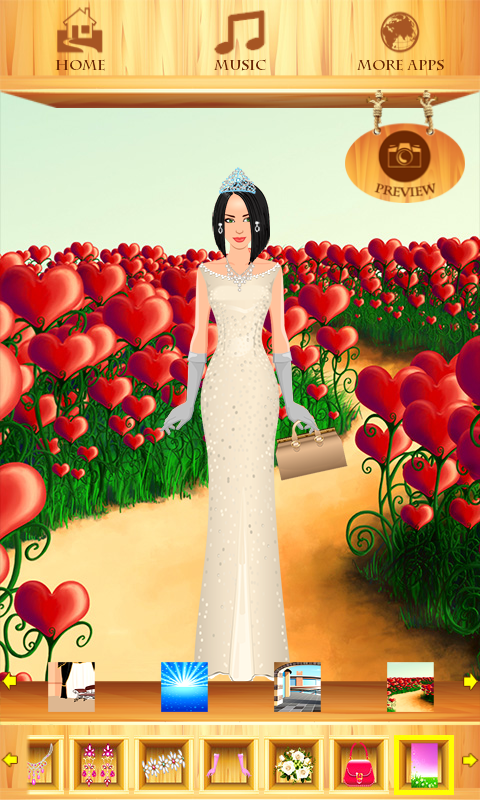 If you want to take a part in this dress designer game and travel through amazing dress up story, just download for free Dress Up Wedding and accept this best fashion challenge. 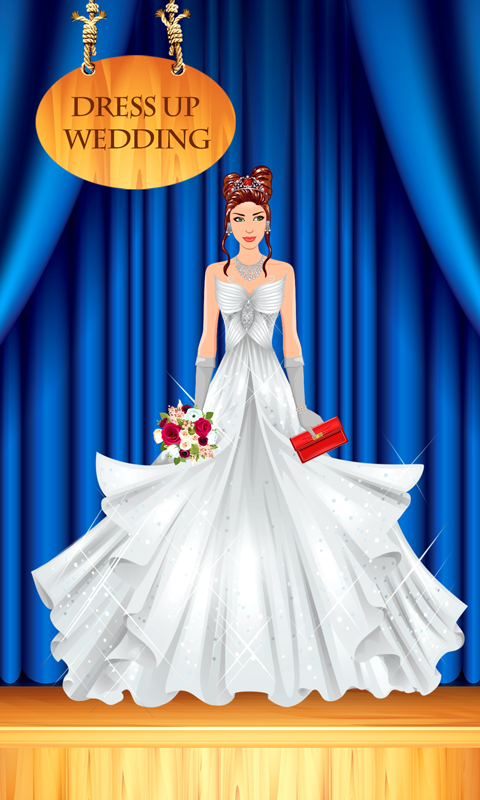 Take your bride in your virtual fashion salon on your smartphone and make her shine like a star. 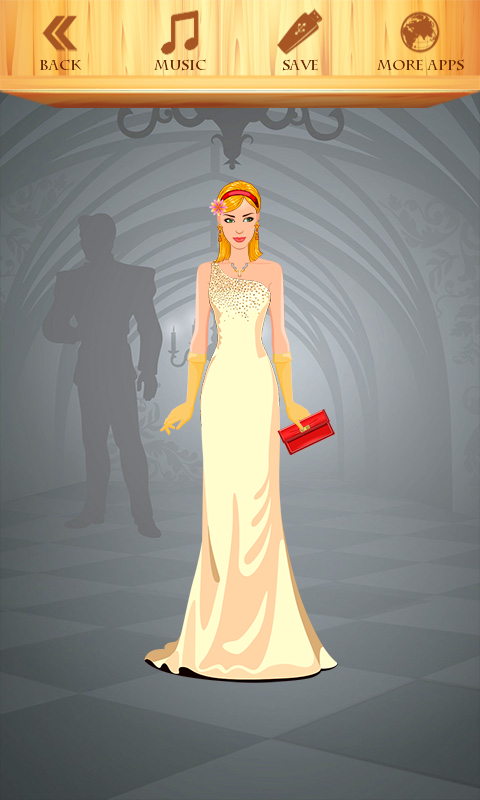 Play this top dress up and makeover game and prepare her for the most important day of her life. Make your own wedding style and be a part of this amazing fashion show. This top fashion design game brings you into the world of wedding magic, beautiful dresses, hairstyles, jewellery, biedermeier flowers. Try a luxurious wedding dresses and help your bride to become a great fashion icon and fashion star. Open virtual fashion closet on your smartphone and find few top categories. â€¢	Category with amazing wedding dresses â€¢	Categories with elegant haircuts, flowers for hair, veils â€¢	Categories with jewellery, like necklace, earrings and bracelets â€¢	Go on and find next sections with bags & shoes â€¢	Biedermeier flowers â€¢	And great backgrounds Choose a perfect combinations of all fashion accessories for her. After creating the wedding outfit for your fashion girl you can take a photo of her. Choose from the variety of cool backgrounds: romantic sunset, glorious flower gardens, beautiful castles. Make your bride happy and let her feel unique and the most luckiest in the world. In this fantastic fairy story there is a lot of wedding ideas, let yours be unforgettable. Practice your fashion designer skills and become the most popular stylist for brides, and maybe your creations will be on the cover of famous fashion magazines. This beauty game is for girls of all ages, and for everyone who like fashion. During the wedding preparation there is so much work to do: deciding about wedding outfits, flowers, unique rings, invitation cards, music, cake etc. The best thing is to hire wedding planner and let him organize the whole ceremony. Everyone knows that the most important thing for every bride is to choose best wedding dress. At the end you can: â€¢	Save your model, take a photo and show to your friends.